Anna Pavlovna was a Russian prima ballerina of the late 19th and the early 20th centuries. 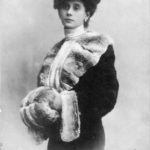 She was a principal artist of the Imperial Russian Ballet and the Ballets Russes of Sergei Diaghilev. Pavlova is most recognized for the creation of the role The Dying Swan and, with her own company, became the first ballerina to tour ballet around the world. "God gives talent. Work transforms talent into genius." "Although one may fail to find happiness in theatrical life, one never wishes to give it up after having once tasted its fruits." "The right to happiness is fundamental."